The distance between Matsue and Izumo is only a one hour drive. The cultural transition, though, is a big leap. It feels like time travel from the Edo samurai period all the way back to the creation of Japan! So, it’s a bit like jamming your thumb on the historical rewind button. On our way to Izumo, we stopped at Saka Shrine, dedicated to the god of sake. Tanaka-san from Rihaku had described this to us so we made a point of looking for it. According to 8th century documents, the Gods may have partied really hard here for 180 days, but now it is just a very quiet shrine dedicated to the sake god. 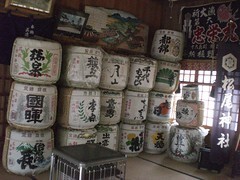 Instead of deities, the Izumo Toji, or brew masters of the Izumo Guild, hold monthly meeting at the shrine. Passing through the stone torii gate and walking up the woodsy stairs, the only thing you hear is roosters. Once at the top of the stairs and having a look around the main building and grounds, there’s no one on the premises. But, some visitors must come looking for good luck, because they have an honor system to simply leave money to get self-serve omamori good luck charms or omikuji fortune telling papers. Aside from the historical significance, myths, and faith people have, the sanctuary is also very popular with young people. Okuninuni no Mikotois enshrined here as the deity of marriage. 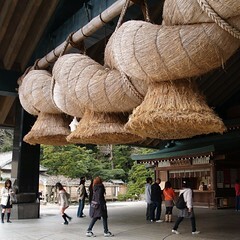 Watching girls jumping up and down to stick a coin into the giant shimenawa straw rope was rather comical, I thought. 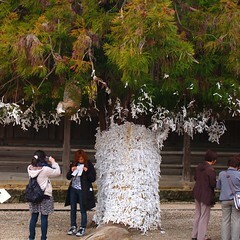 And a big tree totally covered with fortune telling papers tells you just how many people visit the place. Following to the visit to Izumo Taisha, a short walk to the Shimane Museum of Ancient Izumo took us all the way back to the prehistoric era. Walking from the shrine through the museum is like combining a visit to the Knossos Palace on Crete and the National Archeological Museum in Athens all in one. The exhibition showing the excavation of over 300 bronze swords and bells from the Yayoi Period (500 BC to 300 AD) was simply an amazing demonstration of the power this area held then. Natural resources such as iron and good transportation by land and sea made this the ancient crossroads between Japan and the continent and a powerful center for commerce. Other exhibitions at this museum were local myths, including the most famous one of the eight-headed dragon Yamata-no-Orochi. This one is fun because Susano-no-mikoto defeated the monster by pouring him too much sake. 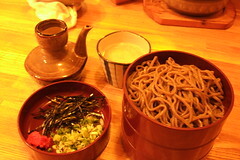 At the holy city, we resorted to famous Izumo soba for dinner. Well, to tell the truth, on Sunday evening around JR Izumo Station, there were nothing open except for a few small soba places. 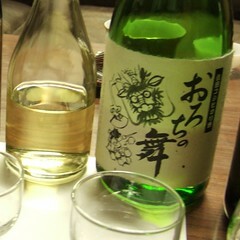 As is often the case with small eateries out in the countryside, the drink menu had two kinds of sake – hot and cold. When we asked which brand, they said the sake was from their neighbor Juji Asahi. 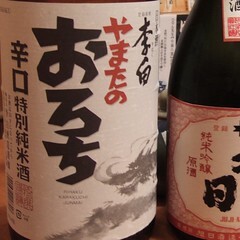 So, we happily ended our day full of wonders with our favorite sake that had drawn us to Izumo. Please visit Tokyofoodcast’s San’in Trip: Day One, Day Two–Follow the Crab, Day Three-Fished Out and Monsters Too, and Day Four-A Glimpse of Samurai Culture in Matsue,. For locations of the sites in the post, please visit Tokyofoodcast’s San’in Trip Series post.